Just a shot of the final panel and placards…ready to fly when the rest of the plane is! This entry was posted in Avionics and Panel on July 8, 2016 by Mark Dickens. As anyone who’s studied the subject of where to put your ELT antenna on an RV-8 knows, there ain’t a good place to do it. When the canopy is open, it covers the entire turtle deck, which is where you’d normally mount the antenna, and where the ELT manufacturers want you to mount it. But, you can’t do it. So, where to put it? Rather than re-hashing the discussion and arguments, I elected to mount mine inside the cabin on a bracket as shown below. Yes, there’s no good ground plane, but as many do, I plan to wear a Personal Locator Beacon (PLB) when flying anyway. I felt like this was the best compromise of all the compromises available. 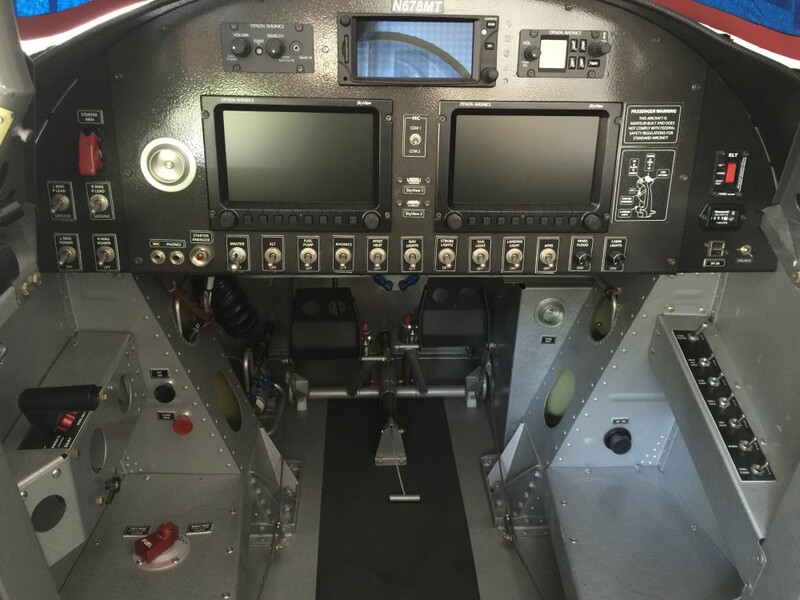 This entry was posted in Avionics and Panel, Fuselage on July 7, 2016 by Mark Dickens. Just a shot behind the panel before we buttoned up the forward skin. As bad as it looks, it’s the best I could do. As much as I enjoyed the wiring process, and I really did, I think that next time, I’ll let someone else do it. 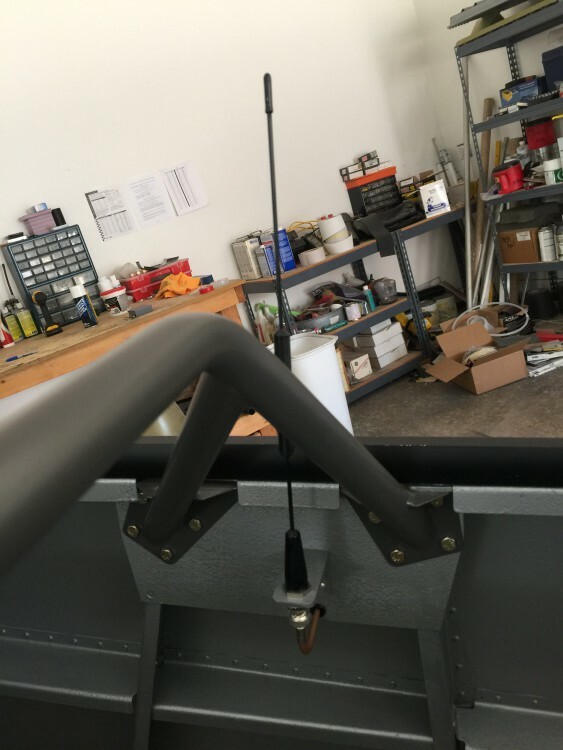 This entry was posted in Avionics and Panel on April 8, 2015 by Mark Dickens. 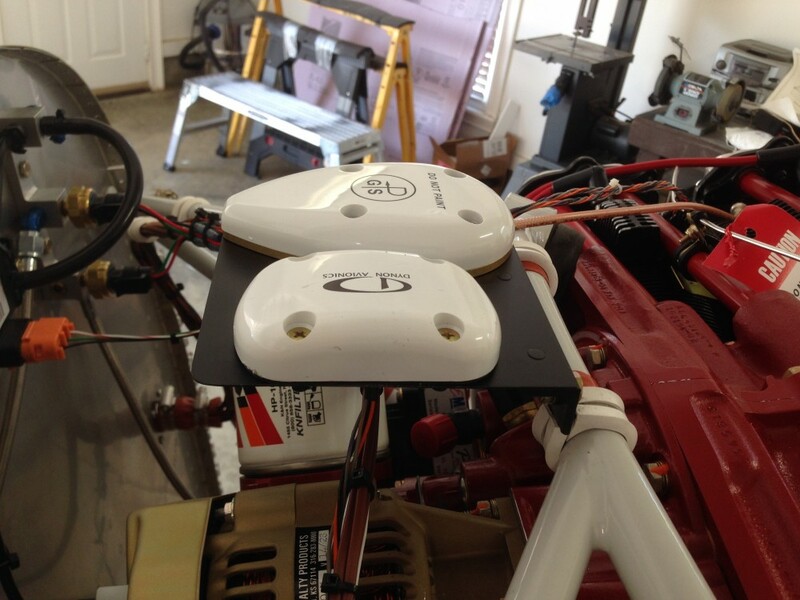 I decided to mount the GPS antennas under the cowling. Since the RV-8 has no room available on the turtle deck, you have to be imaginative to mount antennas. Many have mounted the GPS antennas under the cowling and although there is a potential for problems due to engine heat, I felt it was the least evil of all of the alternatives. Time will tell! 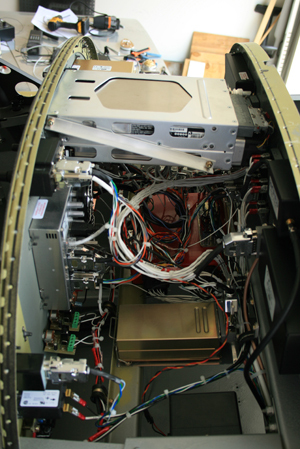 This entry was posted in Avionics and Panel on July 3, 2014 by Mark Dickens. I think I’ve finalized my instrument panel layout. I’ve decided to use two 7″ Dynon SkyView displays, which give me most of the functionality I need. Since I frequently fly on an IFR flight plan, and want to be able to file GPS direct, I’ve added a Garmin GTN650 (or perhaps a GNS430W). For backup purposes, I’ve also added an XCOM 760 transceiver. The starter, flap, autopilot disconnect and control wheel steering switches will be mounted on my Infinity Aerospace stick grip. All of this, combined with Vertical Power’s VP-X Pro, I think will be a very nice setup! This entry was posted in Avionics and Panel on September 17, 2012 by Mark Dickens.